This is the second in a series from Calla Gold Jewelry about the secrets of diamonds and why women want them. I’ll be focusing in this post 0n choosing diamond color. Diamonds actually come in an array of colors, mostly naturally. Yellow, champagne, cognac and blue color diamonds are currently, hot as firecrackers. 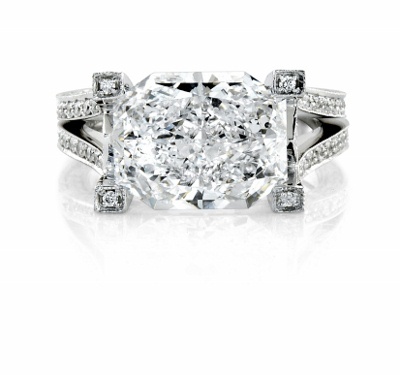 For the average wedding ring, though, stick with as colorless and clear a diamond as you can afford. Also referred to as white, colorless and clear. The Diamond Color Scale, Let’s Get Technical! Diamonds are color graded on a scale from D to Z. D, E, an F color grade diamonds appear colorless. G, H, and I are nearly colorless and when set in a ring they may look whiter than they really are. K, L, and M have faint yellowish, brownish, or grayish tints. The Gemological Institute of America (GIA), is the industry standard of quality in gemstone knowledge. Their grading system is the best and is used in all reputable appraisals of diamonds the world over. How Can You Tell if that Diamond Has Good Color? When choosing diamond color for your special diamond, you’ll want to be looking at at least one diamond with a nicer color and one with a poorer color if possible. It can happen that if you’re looking at a poor color diamond by itself, sometimes it looks just fine. You might be tempted by it’s low price to buy it. But wait! Before you leap, be sure you can hold it next to a finer color diamond. Once you do the comparison, your chosen diamond might suddenly look kinda bad. Bad decision dodged! If you know someone with a very nice white diamond, borrow their ring and clean it and then go shopping. Preferably it is a truly white diamond, like a D,E or F color. By bringing it with you to compare with the diamonds you look at, you’ll immediately be able to tell if the store’s diamond is just funky looking, or nice and white. What you’re doing is seeing both of the diamonds under the special diamond lights, that make diamonds, even less desirable ones look pretty good. The untrained eye isn’t going to easily be able to see the difference between diamonds in the D to H or I range. Nevertheless, finding out the color grade of your potential diamond is super important. The color rating of your diamond will greatly influence the price you pay. 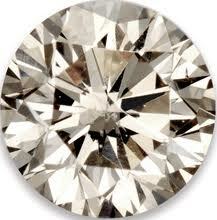 A “D” color diamond might sell for twice what an H or I color stone would sell for. In a Murphy’s Law kinda way, the whiter color diamonds are rarer than the greyer or tan colored ones. And the rare ones are the ones you want. Most crappy diamonds look pretty OK when they are perfectly clean and seen under special bright diamond light conditions. If you are shopping for diamonds in a retail store setting, look around for an area of “ugly light” and look at the diamond in that area. Find that place away from the bright lights, like in a corner, or in the bathroom or a hallway. Look at the diamond you like and try to get a sense of how it’ll look in the lighting you live in. Some diamonds look pretty unimpressive away from the bright lights. You want the diamond that is sparkly and white away from the fancy lighting. 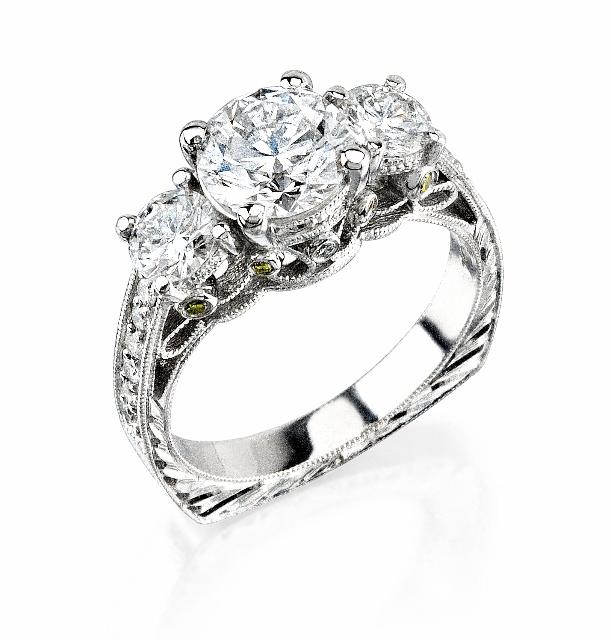 Do shop for diamonds with a reputable jeweler who can easily answer your questions. Pick a jeweler whom you can trust. Ask your friends, read reviews online until you find a jeweler you feel comfortable with. If the jeweler you are checking out is using a different color grading scale than the industry standard GIA scale, you might want to shop elsewhere. Many Jewelers have on hand a Master Set. These diamonds or CZ’s represent a particular color. It can be helpful to look at the master “D” colored example next to the one you like. In this way you’ll see how the “G” color diamond stacks up to a “D” color diamond. In this way you can be sure that you’ve compared your diamond with the ideal color and you can make your choice with confidence. For the record I love G color, it’s what’s in my ring. My first piece of advice is to avoid diamonds lower on the scale than H or I color, but that’s me. This isn’t to say there aren’t nice diamonds lower on the color scale. There are, when you’re looking at perfectly clean, under the magic diamond lights diamonds. But how will they look in the dimmer home lights? How about after you’ve done the dishes wearing your ring without gloves? After you’ve put on some lotion? The whole point of choosing a nice white diamond is that you can live in it, get it dirty and have it still sparkle and look good. When a diamond gets dirty it lowers the look of its color grade. 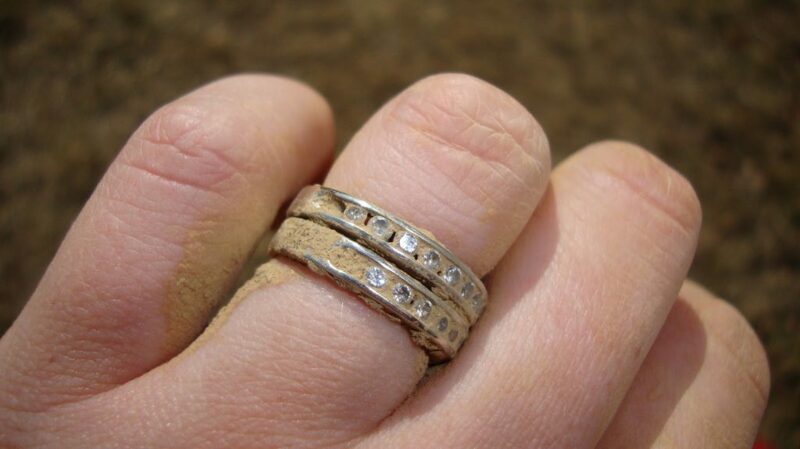 If you have a nice white diamond it’ll still look good when it gets dirty. But if you got an iffy color diamond (like a J or a K) and it gets dirty like the one a certain someone I know got, (I’ll use no names to protect the stubborn, er, innocent,) it’ll look grayish, brownish or icky yellowish. It will not be a symbol of love, but a source of annoyance. The lively look (bright white), of the diamond you choose for your love holds a magical symbolism. This diamond represents your love. Are you going to represent that you were on a budget while shopping for your love symbol? Nah. That bright white color makes your love sweetie smile. It makes her girlfriends smile. It shows your boss and co-workers that you are a quality guy. Yes it’s true the ring is for her, but it reflects on your personality, class and values. May your diamond choice be bright. May your marriage be long and happy. Very important for any lady or gent to know when shopping for the appropriate diamond! Great refresher course Calla, thanks!!! The diamond color chart information is really good here. Calla Gold Jewelry really gives the information to their clients. This in depth overview of the importance of color in diamond buying is really easy to assimilate and use. Sometimes reading about all four ‘c’s at once can be daunting. But I like your one ‘c’ at a time method. I’m also liking the Calla’s opinions part too. I’m looking forward to your final ‘c’ on clarity! What would you recommend in regards to learning more about diamonds? find myself spending a significant amount of time both reading and commenting.